Gun Suppressors supplied and fitted instore. Please contact us to discuss your personal requirements. 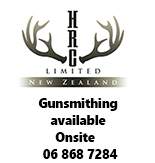 We stock both New Zealand made suppressors as well as International Brands.